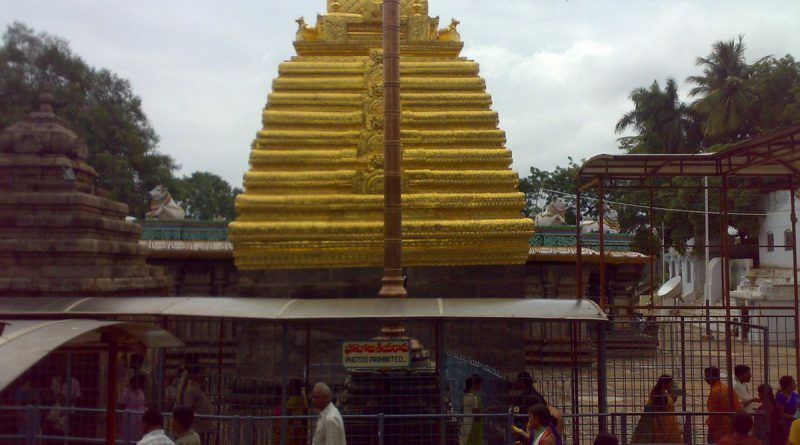 Shri Mallikarjuna Swamy (Shri Mallikarjuna Temple) is one of the twelve Jyotirlingas of Lord Shiva and is one of the 18 Maha Sakti Peetha. This is located in Kurnool district in South Indian state of Andhra Pradesh. The holy temple is situated on a mountain named Shri Shaila at the banks of the Patal Ganga at a height of about 457 metres. This Jyotirling ia also known as Kailash of the South and Shri Shailam. It is the faith that by visiting this holy place one is emancipated from all his sins and worries and bless with innumerable wealth and one is free from the vicious cycle of life and death. The Krishna River, near shrine, is the holy river known as Paathaala Ganga. Devotees take a dip here and carry holy water uphill to perform abhisheka for the Lord. This mythology is the story behind the origin of Sakti Peethas. They are holy abodes of Sakti formed due the falling of Sati Devi’s corpse when Shiva carried it and wandered. It is believed that Sati Devi’s Upper lip has fallen here. When Shiva and Parvati decided to find suitable brides for their sons Ganesha and kartikeya they argued as to who is to get wedded first. Lord Shiva bade that the one who goes round the world in Pradakshinam could get married first. While Kartikeya could go round the world Lord Ganesha went round his parents seven times. In Shastras, going round one’s parent is equivalent to go round the world. Shri Ganesh was married to Siddhi (spiritual power) and Riddhi (prosperity) before Kartikeya. On return of Kartikeya he was enraged and went away to stay alone on Mount Kravunja in the name of Kumarabrahmachari. On seeing his father coming over to pacify him, he tried to move to another place, but on the request of the Devas, he stayed close by. At that time Lord Shiva assumed the form of Jyotirlinga and resided on that mountain by the name of Mallikarjuna. Mallika means Parvati, while Arjuna is another name of Shiva. The place where Lord Siva and Parvati stayed came to be known as Shrishailam. It is believed that Lord Siva visits Lord Kartikeya on Amavasya(No Moon day) & Parvati Devi on Poornima(Full Moon day). It is also believed that Goddess Durga had taken the form of a bee and worshiped Lord Shiva here and selected this holy place as her abode. Every year there is a fair organized on account of Mahashivratri (14th day of the dark half of the month of Maagha according to Hindu almana). This is an ancient temple with fort like walls and very rich sculptural work. This is a huge temple built in the Dravidian style with lofty towers and sprawling courtyards is one of the finest specimens of Vijayanagar architecture. The temple sculptures narrate in stone, epics from there great Hindu epics-Ramayana and Mahabharata. The Geeta Mandir is built here where the divine message of Shrimad Bhagavat Geeta is carved on eighteen marble pillars. The minimum time a bus takes to reach Srisailam from Hyderabad is 5h 57m and time taken by private taxi is approx 4h 39m. Nearest railway station to Srisailam is Srisailam is Markapur Road.